It's JubJub Day, which means it's time for... JUBJUB JUBILEE!! I was startled by a whack on the back of my head. Combined with the unsteady rocking of the boat, it almost knocked me over. "Hey now, stop with the gloom." I turned around to see Lapnir rearranging his tail after using it to hit me. "This isn't like you..."
"Mama! Hey! Mama! Looky what Shrowds brought back from Grave Danger for me!" the starry Xweetok shouted, swinging a manacle mace dangerously above her head. "Isn't it great?" "Samii!" KT shouted. "Stop that! You almost hit me! And that looks spiky and dangerous!" Kata950465 carried the Mechanized Laboratory Assistant while her owner, Lina, walked next to her, debating what to do with the robotic petpet they obtained from Dr Landelbrot. "I don't want to just sell him," Lina mused, "but none of your..."
Aquatic Petpets: Pets or Pests? What you may not know could hurt you! 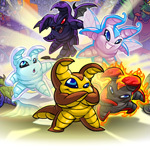 The weird but oddly adorable Petpets that might get overlooked at first glance.